Kiwi is such a delicious fruit and it seems juicy enough to be an ideal ingredient for infused waters, but kiwi simply does not impart a lot of flavor in your infused water. After many test runs, I’ve given up on using kiwi in my water recipes. This theory was recently confirmed by infused water guru Jessica Goodrich who wrote “36 hours has produced a flavor that is more like the fruit and less like the smell. Definitely requires a LONG soak.” So, unless you are will to heavily muddle your kiwi, soak it for 36 hours, then double strain your water mixture, using kiwi is probably not worth it. However! 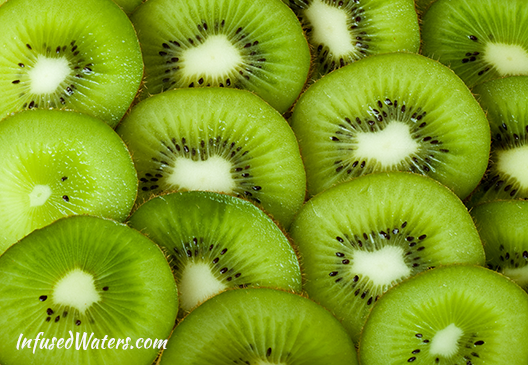 You can always put kiwi in your infused water if you want to add a splash of green color. Kiwi will not alter the flavor of your infused water because, as I was just saying, kiwi is flavorless when soaked in water. The skin is not bitter like citrus rind, either. If you have had success using kiwi in your water recipes, please do let us know your secret! I use strawberry and Kiwi together for a great taste. Good to hear! Do you mash the kiwi? How long do you infuse for? I love kiwi, but never have been able to get a strong flavor from it. Your advice would be greatly appreciated! Hello and congrats on your upcoming wedding! I really appreciate the tip on mashing the kiwis. I will try that when they come back in season. The strawberry combo sounds delish. Thanks so much for sharing! Hi. I’m new to infused water. My first attempt was delicious. Kiwi (very ripe), cucumber slices without the rind, 5 mint leaves and two slices of lime with the rind. I shook it up and kept in the fridge overnight. There were bits in the water but the flavour was fantastic. After I finished the bottle, I just filled it up with water again and gave it another shake. It was still good. Try it, you will be surprised. Hi! I have to disagree strongly here. Maybe the secret is in drying the fruit first? I did try Kiwi infused water! It had great taste! 1kiwi on 500ml water, soaked overnight! Water had the taste and aroma of kiwi. Give it a try! I just made kiwi infused water and just used Kiwi. I took off the rind and just put the Kiwi in my infuser pocket and let it sit in the fridge for an hour and it has it fully flavored! I also shook it a little to help the flavors flow. I honestly think it’s delicious. Also I used really ripe fruit! I have done kiwis in water multiple times and I always have the flavour of kiwi shortly after. I keep the peel off when I slice it up so I can it the fruit after a while. My water bottle has a juicer attached to it i just juiced the kiwi like you would a lemon! It worked really good and you can taste the kiwi also has a great color! I havea habit of freezing everything first before I use it for infusion. This preserves most quality and aids to a cool temperature of course. The other day I did the same with a kiwi and it worked fine… Just chop it up and put it in a plastic bag in the freezer overnight. Evening before just rinse with water to detach the frozen pieces and prep your infusion for the next day. Works just great..
My wife has been drinking kiwi in her water infuser bottle for weeks now, works fine. Taste really fruity. Seems to infuse better cold than warm.